In 1932, the NHL let grain merchant James E. Norris, who had made two previous unsuccessful bids to buy an NHL team, purchase the Falcons. Norris’ first act was to choose a new name for the team the Red Wings. Earlier in the century, Norris had been a member of the Montreal Amateur Athletic Association, a sporting club with cycling roots. 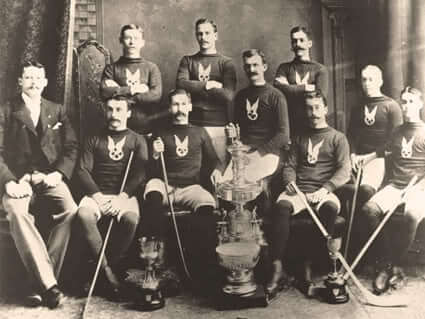 The MAAA’s teams were known by their club emblem and these Winged Wheelers were the first winners of the Stanley Cup in 1893. Norris decided that a version of their logo was perfect for a team playing in the Motor City and on October 5, 1932 the club was renamed the Red Wings. Norris also placed coach Jack Adams on a one-year probation for the 1932 – 1933 NHL season. Adams managed to pass his probationary period by leading the renamed franchise to first ever playoff series victory over the Montreal Maroons. Despite this success, the team lost in the semi-finals to the New York Rangers. The 1937 Stanley Cup Finals NHL championship series was contested by the defending champion Detroit Red Wings and the New York Rangers in their fifth Final series appearance. Detroit would win the series 3-2 to win their second and second-straight Stanley Cup. The 1936 Stanley Cup Final NHL championship series was contested by the Detroit Red Wings and the Toronto Maple Leafs. This was Detroit’s second appearance in the Final and Toronto’s sixth. Detroit would win the series 3–1 to win their first Stanley Cup. 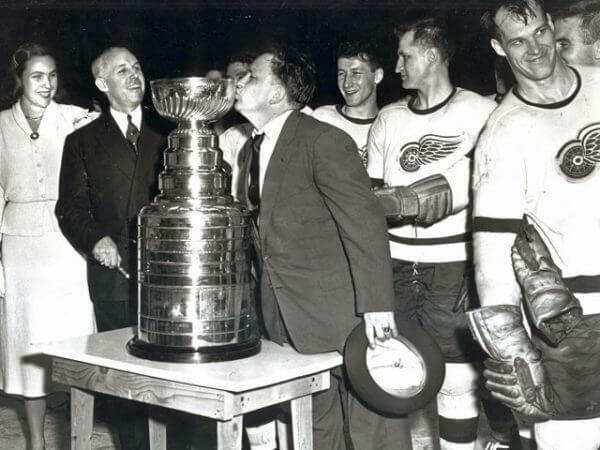 The 1952 Stanley Cup Final NHL championship series was contested by the Detroit Red Wings and the Montreal Canadiens in the first of the four Detroit-Montreal Final series of the 1950s. The Canadiens were appearing in their second straight Finals series, while Detroit was returning after winning the 1950 Final. The Red Wings would win the series 4-0, shutting out the Canadiens twice and allowing one goal in each of the other two games. By doing so, the Red Wings became the first team to go perfect in the playoffs. The 1950 Stanley Cup Final NHL championship series was contested by the New York Rangers and the Detroit Red Wings. It was the Rangers’ first appearance in the Final since their Stanley Cup victory in 1940. The Red Wings would win the series 4-3 to mark their franchise’s fourth Cup win, and first since 1943. The 1943 Stanley Cup Final was a best-of-seven series between the Boston Bruins and the Detroit Red Wings. The Red Wings, appearing in their third straight Finals, would win the series 4–0 to win their third Stanley Cup. The 1955 Stanley Cup Final NHL championship series was contested by the Montreal Canadiens, appearing in their fifth of ten straight Finals and the defending champion Detroit Red Wings, in the fourth Detroit-Montreal Final series of the 1950s and the second consecutively. The Wings would win the series 4-3 to win their second consecutive Stanley Cup and fourth in six seasons. It would be 42 years before Detroit would win another cup, in 1997. 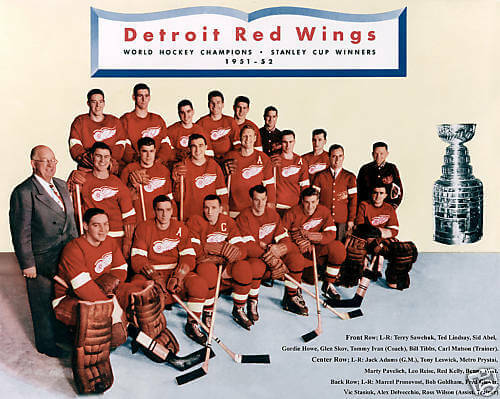 The 1954 Stanley Cup Final NHL championship series was contested by the Detroit Red Wings and the defending champion Montreal Canadiens, in their fourth-straight Finals. It was the third Detroit–Montreal Final series of the 1950s. 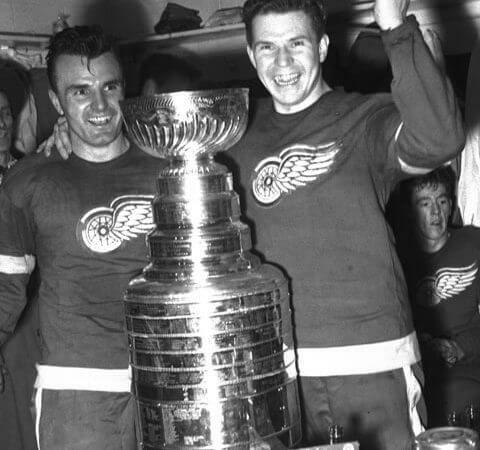 The Wings would win the series 4–3 to win their first Stanley Cup since 1952, and sixth overall. The 1998 Stanley Cup Finals NHL championship series was contested by the Western Conference champion and defending Stanley Cup champion Detroit Red Wings and the Eastern Conference champion Washington Capitals. It was the 105th year of the Stanley Cup being contested. It was the Capitals’ first appearance in a Stanley Cup Final since the franchise’s inception in 1974. The Red Wings won the series for the second year in a row, four games to none. It was the Wings’ ninth Stanley Cup, and as of 2014, this is the last season in which a defending Stanley Cup champion has successfully defended and retained the Stanley Cup and is also the most recent time when a Finals concluded with a sweep. The 1997 Stanley Cup Final NHL championship series was contested by the Detroit Red Wings and the Philadelphia Flyers. Detroit was in the Final for the second time in three years (the other coming in 1995, when they lost to the New Jersey Devils) while the Flyers were making their first appearance since losing in the 1987 Final. Detroit won the series in four games to win the Stanley Cup for the eighth time in franchise history and the first time since 1955. Detroit was the last team to win the Cup without having home ice advantage in the Finals and with fewer than 100 points earned during the regular season until 2009. The 2008 Stanley Cup Final was the best-of-seven NHL championship series of the 2008 Stanley Cup playoffs contested between the Western Conference champion Detroit Red Wings and the Eastern Conference champion Pittsburgh Penguins. This was Detroit’s 23rd appearance in the Final, and its first since winning the Cup in 2002. This was Pittsburgh’s third appearance in the Final, and its first since winning consecutive Cup championships in 1991 and 1992. The Red Wings defeated the Penguins four games to two, and were awarded the Stanley Cup. Detroit’s Henrik Zetterberg was awarded the Conn Smythe Trophy as the Most Valuable Player of the playoffs. The 2002 Stanley Cup Finals was the NHL championship best-of-seven series of the 2002 Stanley Cup Playoffs contested by the Western Conference champion Detroit Red Wings and the Eastern Conference champion Carolina Hurricanes. It was Detroit’s twenty-second appearance in the Final, their previous appearance being a win in 1998. It was Carolina’s first appearance in the Final in franchise history. Detroit defeated Carolina in five games to win their tenth Stanley Cup championship in franchise history. 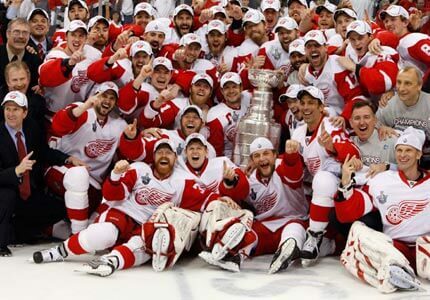 The Red Wings became the first team in NHL history to win the Cup after starting the playoffs with two losses at home. After losing the first two games in the Conference Quarterfinals to the Vancouver Canucks, the Red Wings then won 16 of their next 21 games en route to win their third Cup since 1997 for coach Scotty Bowman. Bowman’s win, his ninth, established a new coaching record, surpassing the mark he held with Montreal coach Toe Blake. The Detroit Red Wings are a professional ice hockey team based in Detroit, Michigan. They are members of the Atlantic Division in the Eastern Conference of the National Hockey League (NHL) and are one of the Original Six teams of the league. Founded in 1926, the team was known as the Detroit Cougars from then until 1930. For the 1930 – 1931 and 1931 – 1932 seasons the team was called the Detroit Falcons, and in 1932 changed their name to the Red Wings. Red Wings – After purchasing the Detroit Falcons in 1932, James Norris renamed the team after the “Winged Wheelers,” the nickname of the Montreal Hockey Club for which he once played. Who is the greatest Detroit Red Wings? The Detroit Red Wings are a professional ice hockey team based in Detroit, Michigan.